Higher Valve Lift Not only are the CRF250R’s valves bigger, but they lift higher too, from 9.2mm to 10.5mm intake and from 8.4mm to 9.5mm exhaust. 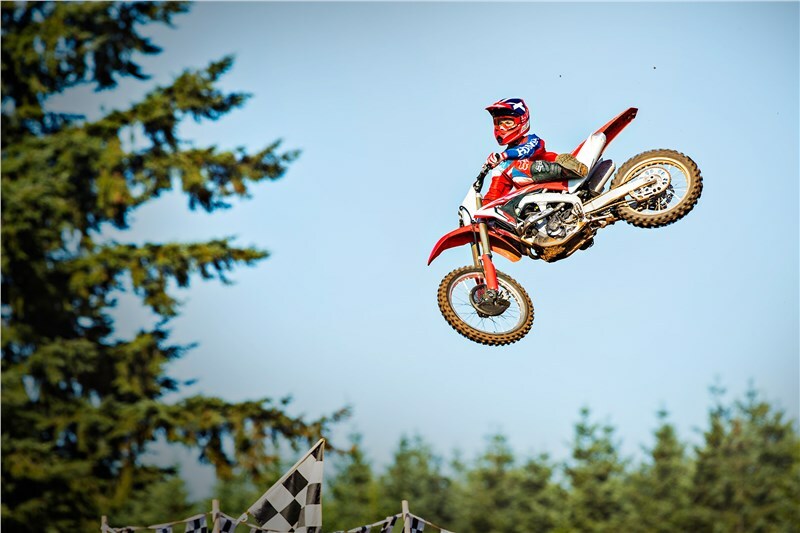 That’s a huge boost, and really helps the CRF250R breathe for more power. Larger Valve Diameters We bumped up the valve diameter on both the intake and exhaust side, from 30.5mm to 33mm on the intakes and from 25mm to 26mm for the exhaust. Combined with the higher lift, the twin-cam CRF250R flows a lot more, especially at high revs when you’re wicking it up. 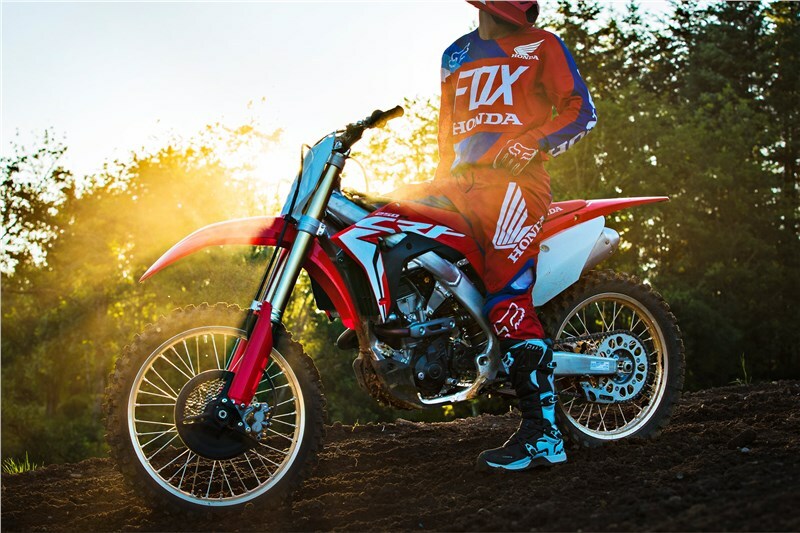 Higher Redline With our better-breathing DOHC design and the new big-bore/short-stroke engine, the CRF250R’s rev limit jumps an additional 900 rpm. Peak power and peak torque are also up, and the horsepower peak is increased by another 2000 rpm. More Power Who doesn’t want more power? With the 2018 CRF250R, you get both more peak power and more peak torque, especially on the top end. Hold that throttle open and head for the first turn—the CRF250R is designed to win that critical holeshot drag race. Lower Rear Shock Mount By lowering the rear shock mount on the frame, the new CRF250R benefits from both a lower center of gravity (cg) as well as gaining chassis stability. Showa Spring Fork The 49mm Showa® fork features a conventional spring design that helps increase the CRF250R’s front-suspension precision, handling and feel. The 39mm piston diameter and 25mm rod diameter guarantee a plush feel and supple action. Shorter Swingarm Shortening the CRF250R’s swingarm helps make it lighter, and also helps give the bike better rear-wheel traction, important considering how much more power you have on tap. The new design also reduces the bike’s unsprung mass. Dunlop MX3S Tires Developed using Dunlop’s latest “block-on-block” design technology, the CRF250R’s MX3S tires give excellent feedback and are a perfect complement to the CRF250R’s frame and suspension. 260mm Front Brake The CRF250R’s large front-brake disc measures a whopping 260mm. You get great brake feel and a wave pattern that cuts down on weight. Front and rear brake-disc guards are part of the package too. 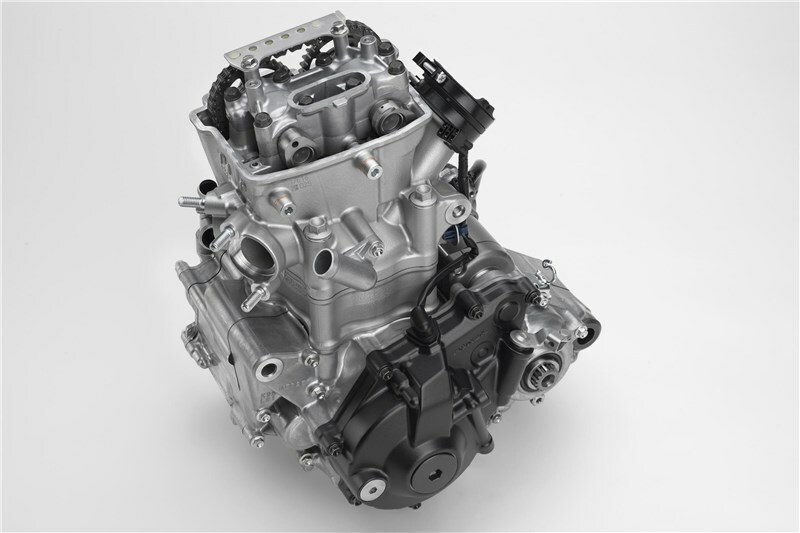 DOHC Engine Layout The 2018 CRF250R uses an all-new double-overhead-cam (DOHC) engine layout with a unique finger-follower rocker design. Together with the rest of the engine’s new architecture (bore and stroke, intake tract, piston, and more), you get more power and a higher redline. Titanium Intake and Exhaust Valves Light is right when it comes to a high-revving engine’s reciprocating masses. That’s why the CRF250R gets titanium intake and exhaust valves. Plus, the valve angle is reduced to a super-narrow 20.5 degrees (included). Ovalized valve springs and long-wearing Diamond-Like Carbon (DLC) treated finger rockers complete the package. Downdraft Intake and Exhaust Layout The new DOHC cylinder-head design let our engineers straighten out the CRF250R’s intake and exhaust tracts. The intake is shorter and just about arrow straight, and the exhaust flows more efficiently too. No athlete’s going to win a sprint if he tries to run while holding his breath, and it’s no different with your bike’s engine. You’ll experience both more power and better throttle response. Big Bore/Short Stroke By changing the CRF250R’s bore from 76.8mm to 79mm, and shortening the stroke from 53.8mm to 50.9mm, our engineers have created a high-revving engine with plenty of room for large valves. 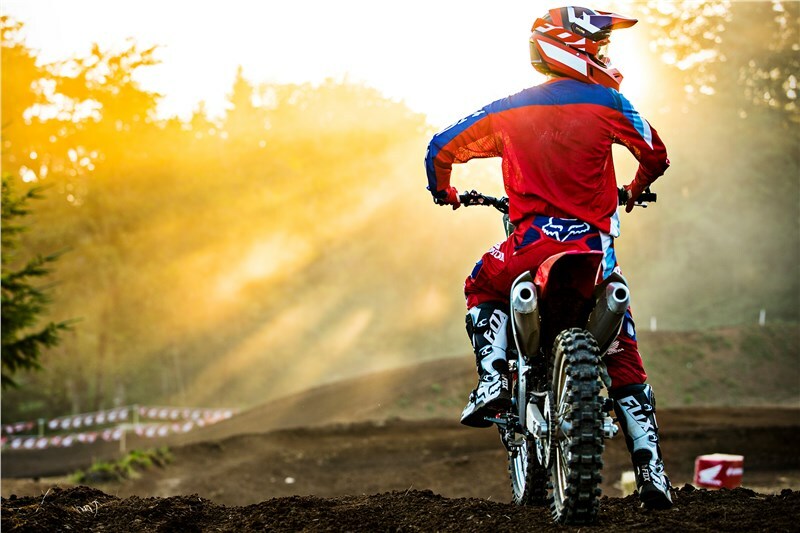 The new engine breaths and revs—the two keys to making power in the motocross world. 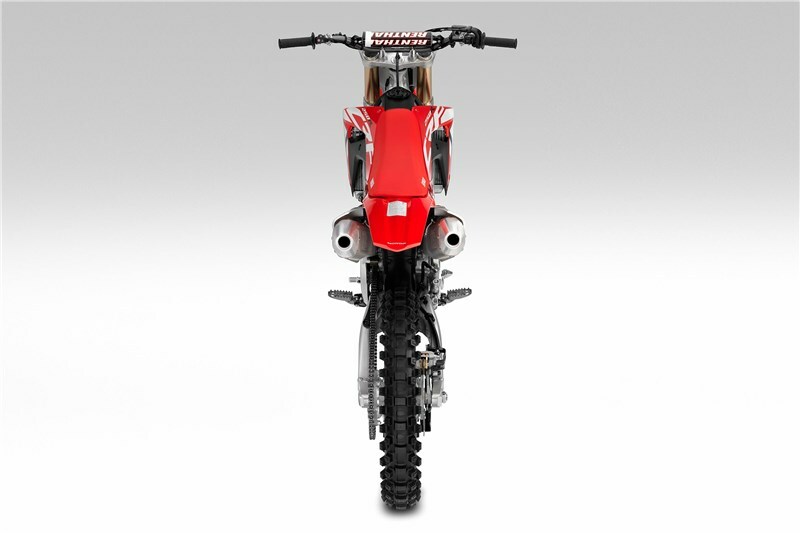 All-New Dual-Exhaust System The CRF250R’s all-new dual-exhaust system is light, compact, and positioned close and low in the frame to take weight off the rear end and bring more mass to the bike’s center for improved handling. It also allows for more airflow, and that equals added horsepower. 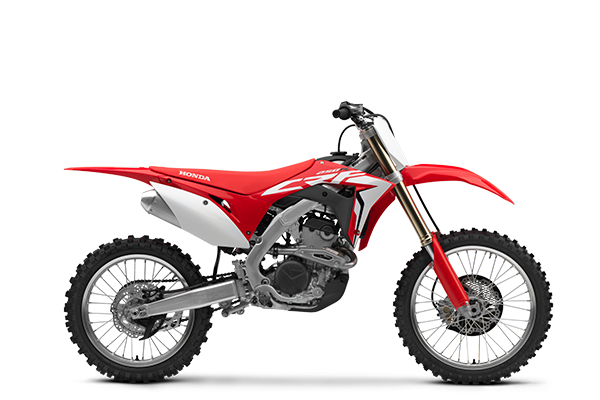 Electric Start Big news for 2018—the new CRF250R gets an effortless electric starter. Convenient and lightweight, it’s a huge deal if you need to restart a stalled bike in the heat of battle. Bridged-Box Piston A first for a Honda MX bike, the new CRF250R features a bridged-box piston design developed on our factory racebikes. Why? The reinforcing structure between the skirts and the wrist-pin bosses lets this big-bore piston retain a light, strong construction and helps enable the CRF250R’s high redline. “H” Section Crank Look closely at the CRF250R’s crankshaft profile and you’ll see its “H” cross-section design. What’s up with that? Just like a structural “I” beam in an aircraft wing or a skyscraper, it boosts strength and cuts weight over a conventional crank’s shape. We shaved off over ¾ of a pound—a big deal when you consider this part spins at over 14,000 rpm! Gradual Pipe-Bend Radius Notice how the CRF250R’s dual exhaust pipes make gradual, large-radius bends out of the head, then flow straight back to the mufflers with no abrupt angle changes. 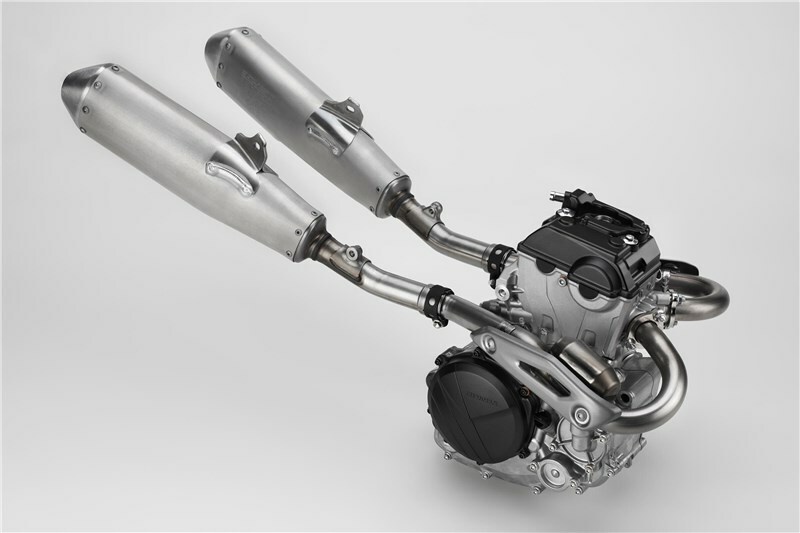 Getting the exhaust out of the engine—while still maintaining a tuned exhaust length, is the key to power, while the pipes’ low mass and twin-silencer design optimize the CRF250R’s center of mass for superior handling. New Clutch Design and Materials We totally overhauled the new CRF250R’s clutch design. The clutch basket is completely new, and the clutch plates use two different types of friction material. Why? The new clutch can handle the increased power of the new engine without being any larger—in fact, we even shaved off 200 grams—nearly half a pound of rotating weight! Lithium-Iron-Phosphate Battery Like the rest of the CRF250R, the bike’s new Lithium-Iron-Phosphate battery is both super light and high performing. In fact, it weighs less than half the weight of a conventional lead-acid battery. Titanium Fuel Tank Every gram counts on a bike in the 250 class, which is why we made the switch to a titanium fuel tank on the 2018 CRF250R. Light and strong, it’s also thinner than our previous plastic unit, freeing up more space and helping to centralize fuel mass. Engine Oil Scavenge Pump Deep in the engine, there’s a special oil scavenge pump. While you may never see it, it helps keep the CRF250R’s overall design compact. 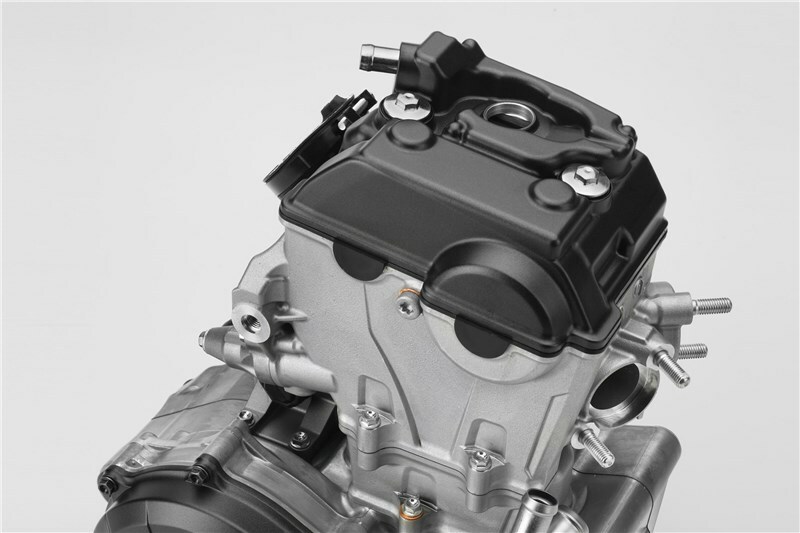 Shared Engine/Gearbox Lubrication The 2018 CRF250R uses a new, shared engine/transmission oiling design. Why? Combining the two systems shaves weight and helps make the engine more compact, especially when it comes to placing the right-side cam drive and the clutch so close together. 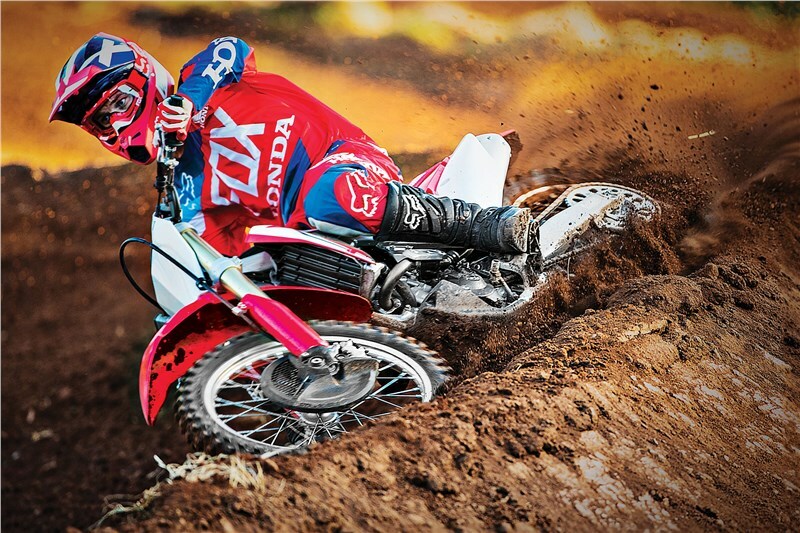 Smooth Styling Blending the new CRF250R’s body panels does more than just make the bike look smooth, fast, and stylish. It also helps you move around on the bike while riding. Nothing wrong with smooth, fast, and stylish, though. “In Molded” Graphics With the all the time you’ll be spending in victory circle, you need to look your best. The new CRF250R has you covered. Our “in molded” graphics look great, and stay looking good longer. 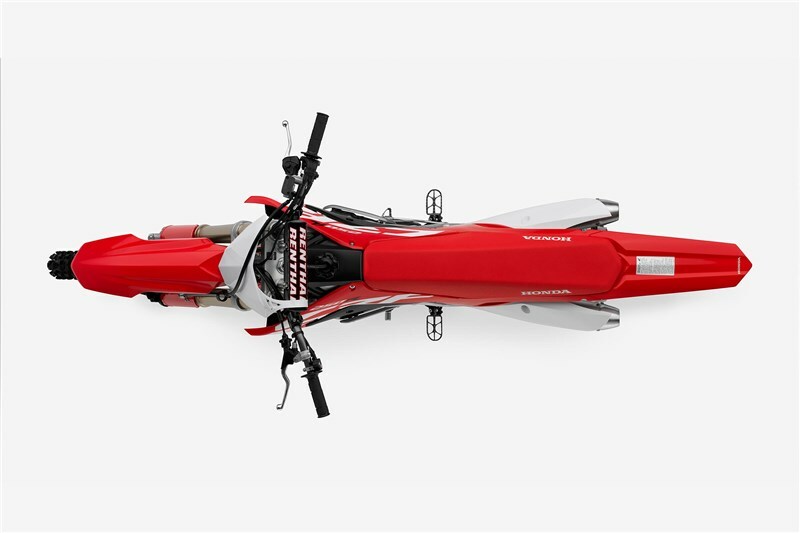 New Rear Subframe The 2018 CRF250R’s new subframe uses extruded rear members that produce a 20-percent reduction in weight. 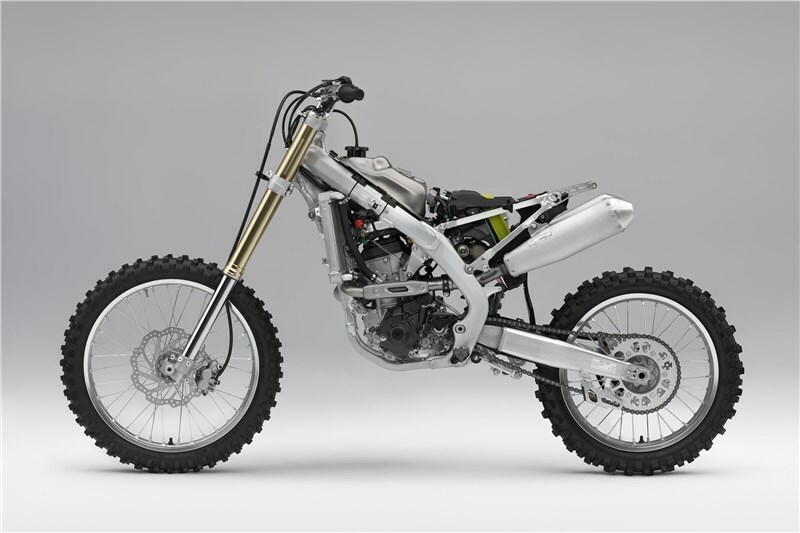 Since that weight comes off the top of the bike, it also contributes to the CRF250R’s lower center of gravity. 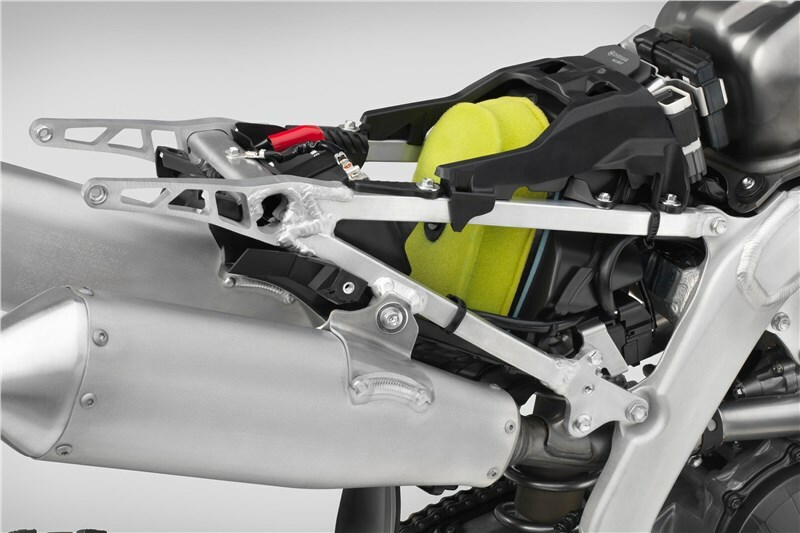 Flat Seat/Tank Junction The 2018 CRF250R features a flat seat/tank junction, including a titanium fuel tank. The superior ergonomics make it easier to move forward and back on the bike, increasing your control.